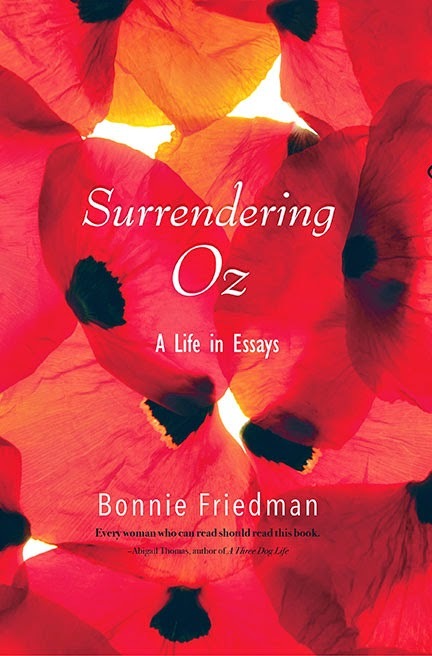 Bonnie Friedman’s Surrendering Oz: A Life in Essays, was longlisted for the 2015 PEN award for the Art of the Essay and shorlisted for the 2015 CLMP Firecracker Award for Creative Nonfiction Writing. It's a warm, enchanting, teeming pool of connected essays that can startle and deceive a reader. The prose hums along, playful and quirky, and, without a warning, will turn and point to something inside the reader that he or she didn't know was there. It is unnerving, but ultimately enrapturing, the writer who can lead a reader to self-analysis. What organizes Surrendering Oz are reflections on the moments of perverse, fantastical speculation that leave one oblivious to the now, eyes swerving from external reality. In this quest, Friedman’s probing is reminiscent of her second book, The Thief of Happiness: The Story of an Extraordinary Psychotherapy, but offers arresting new insights. Friedman’s best-selling, most anthologized work is Writing Past Dark: Envy, Fear, Distraction, and Other Dilemmas in the Writer’s Life, but almost all of Friedman's writing ends up in marquee journals and collections: Ploughshares, Image, The Sun, Utne Reader, Best American Movie Writing, Best Spiritual Writing, Best Writing on Writing. Apart from the skilled hands of a book architect, she has a viable life: tenured teaching job at the University of North Texas and time split between the hipster college town Denton, and Brooklyn. Clinton Crockett Peters: “It still happens to some of us that we land the job, win the award, celebrate the marriage — and succumb to a certain bewildering joylessness, a familiar sense of fraudulence, an inability to feel the anticipated pleasure. The sensation of being insufficiently alive.” Why did you open the book, Surrendering Oz, with this very cutting observation on the first page? Bonnie Friedman: I wanted to start by announcing the problem, or one of the problems, that I was going to look at in the book. One of the themes of the book is a kind of death-in-life quality that I believe afflicts many people, and that we don’t like to talk about because it makes us feel weird and ashamed. We tell ourselves – and our culture tells us -- that if we could only achieve x or succeed at y, we’ll be happy. And so, if this doesn’t happen, we often assume that we need to pursue the next recognition or life-event that will make us happy. I recall quite vividly discovering a certain wonderful essay acceptance, and feeling ecstatic for precisely one day. And yet, as it happened, other things that weren’t supposed to be of any vast significance to me made me feel radiant in a far more enduring way. So this was one of the things that I wanted the essays to examine because it had really been a troubling theme in my own life: self-possession versus zoning out. Those of us who were trained in being liked, being charming and nice are, I think, particularly in danger of a certain self-estrangement that makes our internal life a mystery and a problem. And I wanted to examine this, and to announce my intention from the outset. CCP: Reading your book, I'm reminded that part of growing up is realizing that there is no plot, no author, but a kind of discursiveness to existence. What helps a writer come to terms with this cold reality and help others understand? BF: I think the act of writing itself can be enormously useful because it is as if you are setting down on a swathe of your own life this magnifying-glass paperweight. Did you ever see one of those? They distend but render legible whatever you set them on. And writing does this, allows a certain portion of our experience to swim up vividly before abruptly subsiding. Examining the significance, and also the textures, of one’s own experience is an enormously consoling activity and bestows the sensation that one’s life has become tangible and carryable, something you can put in your pocket, something you can use like a coin or an ax, something transfigured, whereas in fact, of course, the life remains whatever it was. The writing is quite separate from it. Then, too, I think this “cold reality” that (as you aptly put it) there is no plot, no author, but a kind of discursiveness to existence -- I think this is not cold but actually quite hot, that is, quite thrilling. It means that we can free ourselves from worshipping the false gods of our culture. It is awful to spend years setting down pots and vessels before a god only to discover that the god is made of stone – especially if the pots and vessels you have set before it are full of your own life blood. Any of us who has had this experience – of thinking that the god would reward us for some needless sacrifice we’ve spend years making, of thinking that all the miserable grubby goody points we’d collected would be redeemed, only to find out that no, you are not actually rewarded for masochism and perhaps even cowardly self-sacrifice – wants to spare others. I’m thrilled to see that you find in my pages this message about the discursiveness of existence. I’m so glad to think it’s there. I believe what de Beauvoir and Sartre believed, I suppose, which is that it is up to us to create the meaning in our lives. CCP: One thing I'm routinely surprised by in your work is the analysis you've done on your former self to understand who you were in the moment. Is that product of time, reflection, writing, therapy, some sort of combination? BF: Years ago I was in psychotherapy, and if I hadn’t been in it, I believe I wouldn’t really know how to think. This is despite the fact that I had two graduate degrees by the time I began psychotherapy. Until I was in psychotherapy it was as if I lived in a house that was haunted. There were inner howls whose significance I had no way of understanding, and cold gusts that came up from under the floorboards, and myriad sensations I dismissed because they made no sense to me. I loved my sister; how could I also resent her? I adored my friends; how could they also frighten me? In psychotherapy I discovered the truth of ambivalence – which ultimately allowed me to become free to choose truly kind friends who didn’t arouse ambivalence. The friends I have now don’t frighten me. Similarly, in psychotherapy I discovered that there were important reasons for those cold gusts, those strange howls – that is, I discovered that we each of us make sense, if we’ll only bother to dignify the internal signs with real scrutiny. And this discipline in noticing meaning transformed my writing. There was no going back. It was enormously satisfying to finally see what things meant, to no longer, in a way, be a dope. Although I must say that when I reflect on a former self I am also reflecting on who I am now, as all our former selves are stuffed inside us. And so there’s never anything idle in the work. I’ve known many people who seem averse to self-awareness. It’s too excruciating for them to see what they are doing. And so I’m grateful for having had the training in noticing. And for being allowed to develop a writing discipline that allows me to develop my understanding. CCP: A really general question, but how do you go about organizing your essays? BF: I am always pursuing the answer to a question. Sometimes I have to progress by association. An image appears, or a memory, that I know is a step on the way to answering the question, and I have to write down that image or depict that memory to discover its meaning. And then sometimes I can’t just shortcut to the meaning once I’ve found it. I have to leave in the little scene that conjured the meaning because that’s part of the meaning, it’s, in a way, the body of the meaning. After all, writing isn’t really about an idea but an experience. There are no new ideas, only new experiences. And so we have to leave in what we hope will help the reader experience the insight at which we’ve been lucky enough to arrive. CCP: Thinking about “The Watcher,” how did it shape up to be about your dad, your sister, graveyards, and getting to be, as you write, “a grown-up, grown-up”? What was it like pulling together all these strands? BF: I wrote the first draft at the encouragement of a friend. He liked the stories I would tell about visiting my parents. He would read these stories aloud to his own friends. I used to send him one installment a week, detailing that Wednesday’s visit to the Bronx. He would read these stories aloud to his dinner-party friends on Friday night. This friend gave me some terrible advice. It was advice so bad that it absorbed years of my writing life because I couldn’t help following it. He thought that if I wrote down every single thing that happened while I visited my parents, and didn’t try to shape the sections in any way whatsoever, and also if I explained nothing, simply assuming that the reader would get it, that I’d have a masterpiece. And of course it felt magnificent to believe this. I don’t need to do anything! The book is writing itself! “You are channeling from the source,” my friend would tell me. “Don’t try to understand.” Put like that, it sounds like a joke. But my friend was serious. And he’s one of the smartest people I know. I took hundreds of pages of notes. But when I approached an actual publisher with the manuscript, and when I shared it with writer friends, they complained about shapelessness. “It’s yard goods,” my husband said. And they were right. But I did get from it this one particular essay. Since I wrote down everything that happened on this graveyard visit, I had a transcript of the conversations – funny and sad and wrenching – that happened, as well as a chronicle of my secret worries at the time. And then I worked on giving it shape. I realized that something significant needed to change by the end of the essay. And that there was a main character -- my father – who was going through a major struggle. It was all there in the notes; it merely needed drawing forth by allowing the major scenes to breathe and by allowing myself the kind of meditation that’s natural to the essay form. CCP: In several of the essays in Surrendering Oz, you mention some anxieties with taking your first tenure-track job at the University of North Texas. How has entering the academy full time affected your life and writing? BF: There is less time to write and yet I believe my writing has more authority. I had been writing for years alone in my own little room at the back of my apartment. My husband was supporting me. I wore pajamas until four PM, and even went to the local Key Food in them – they were lilac stretched-out sweatpants. I didn’t think it mattered what I wore; I believed I was semi-invisible, semi-make-believe. Teaching allows a person to experience their own authority. And teaching a great deal allows you to encounter many different kinds of people. I’ve acquired a bit of perspective I believe I wouldn’t have otherwise. Previously I was glued to my experiences, immersed in them. My writing was an attempt to acquire some distance on them, to detach. Teaching, and simply being out in the work world, makes it easier to achieve that detachment and even to view oneself as a character in life’s great carnival. I’m certain I wouldn’t have achieved that viewpoint if I’d remained in my little writing room, delectable as it was there. CCP: The book’s title essay combines your film criticism of The Wizard of Oz with personal reflection. How did you muster the courage to combine genres? Did you have any anxieties about writing critically? BF: I had no anxiety about writing critically because I was writing for my life. I urgently needed to understand what was the matter with me, and the answer seemed to be, believe it or not, inside The Wizard of Oz, that great cultural icon. I needed to understand who in my life had said, “Go this far and no farther.” I needed to understand why I’d gotten stuck when I’d achieved professional endorsement at long last. And I didn’t have any memory of my parents or my teachers telling me to stop, to turn back. But I did suddenly remember – yes, quite clearly – that The Wizard of Oz had taught me “there’s no place like home,” and that if I ever believed I’d lost my heart’s desire – if I really believed it lay further than my own back yard – then by some strange illogic I must be confused because by definition a girl couldn’t want anything more extensive than that. By definition female wants were wants for home. And so I examined The Wizard of Oz with a kind of extraordinary delight because I kept finding in it clues to understanding my own quandary. I could see how the male adventure story held an opposite message – that a man was supposed to feel at home in the world. And by the time I was done looking at the Oz story, it really had transformed me. After that I really was able to begin doing the work for which I’d been contracted. Studying Oz helped get me over my writer’s block. I remember sitting in that ice-glazed hammock in my back yard just thrilled by this sensation of ambient beauty – and it was ironic because there was a way everything I wanted was tucked within my own back yard, but I’d had to venture very far to see this. Men are encouraged to have this experience of going far away whereas women are taught to be ambivalent about departure. They are taught that home might not withstand their going. And for me, writing involved departure. It involved the permission to go far away. CCP: I remember you once saying that you found it difficult to write without large blocks of time. Has it always been this way for you? What's changed? BF: Alas, little has changed. I still need large blocks of time. Mostly I get them on the weekends. CCP: Your essays can be very revealing in their intimacy. Was there any discussion with your husband, Paul, for instance, about how you would address certain details? BF: I’ve been very lucky in that my husband has never quarreled with what I needed to write and to publish. I told him what was in the book after it was done. He didn’t concern himself with it. It was somehow my business. I love the freedom that he assumes ought to be mine. Gertrude Stein wrote, “I write for myself and strangers.” That’s true of me as well. I’d almost prefer that nobody I know read my books, although I’m grateful when they do. CCP: What's the best way that you know to understand one's self on the page? BF: The best way I know is to write the scenes that carry a great emotional freight and then to pay attention to the clues they provide. The very act of taking something – a person, a thing – from the medium of life and ushering it into the medium of writing changes its valence. Awarenesses that might have been inaccessible your whole life suddenly jump out. Also, certain objects taken from life will become emblems when you plant them on the page. A pair of down-at-the-heels oxblood tassel loafers that are scuffed in the back and that your boyfriend wore – suddenly you see how they have an air of almost theatrical self-pity to them: they indicate a person who hadn’t been nurtured enough and who is melancholic and sulky, but for a good reason. The shoes, when you describe them in all their particularity, tell you that. Even the width of the leather frill that is typical of such shoes; suddenly you see it as a kind of rick-rack bib. Pay attention to what the things are telling you, and what the arrangement of characters is telling you, and what you glean yourself even if you don’t know how you do. That is always a good practice. Our writing allows us to be dreamer and analyst, and to tell the future, as well. BONNIE FRIEDMAN’s newest book is Surrendering Oz: A Life in Essays, which was longlisted for the 2015 PEN/Diamonstein-Spielvogel Award for the Art of the Essay. Her essays have appeared in The Best American Movie Writing, The Best Buddhist Writing, The Best Writing on Writing, The Practical Stylist: with Readings, and The Best of O., the Oprah Magazine, and she’s had two Notable Essays in The Best American Essays. She is also the author of the bestselling and widely anthologized Writing Past Dark: Envy, Fear, Distraction, and Other Dilemmas in the Writer’s Life. She teaches at the University of North Texas, and divides her time between Denton, Texas, and Brooklyn, New York. 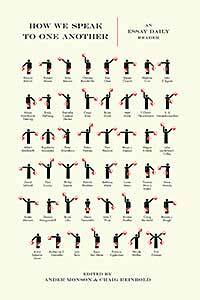 CLINTON CROCKETT PETERS has an MFA in nonfiction from the University of Iowa where he was an Iowa Arts Fellow. He is pursuing a PhD in creative writing at the University of North Texas and has work published or forthcoming in Shenandoah, Green Mountains Review, upstreet, Waxwing, The Rumpus, Fourth Genre, and DIAGRAM. He has worked as an outdoor wilderness guide, an English teacher in Japan, and as a radio DJ.